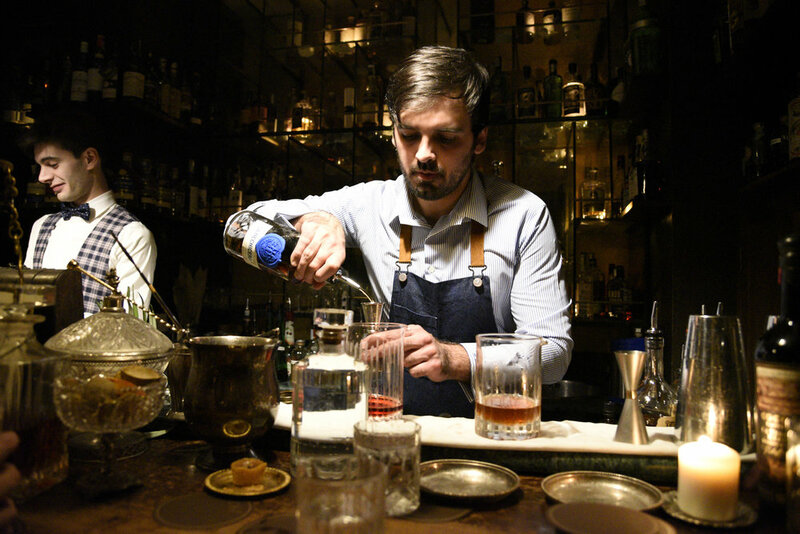 Last weekend Elias Stergiopoulos of Baba Au Rum visited Milano to do a guest shift at 1930. In case you haven't heard of Baba Au Rum, they are a tiki bar from Athens, Greece and are currently in 40th place on the prestigious World's 50 Best Bars list. Elias' guest bartending was a great success, with 1930 being at full capacity all night. The 4 drinks Elias brought to Milano were awesome and below we highlight our favorites. Thanks to Benjamin for organizing the event and to the sponsors Ghilardi Selezion, DonQ, Mezan Rum and Doorly's for making this awesome night happen. The other drinks included the tasty Rum in fashion (Mezan Jamaica, Mavrodafni reduction, Gematria aromatic bitters, Orange zest) and wonderful revisited Negroni, Buccaneer's negroni (La Hechicera rum, Campari, Carpano Antica Formula, Lime zest, Tonka Bean).